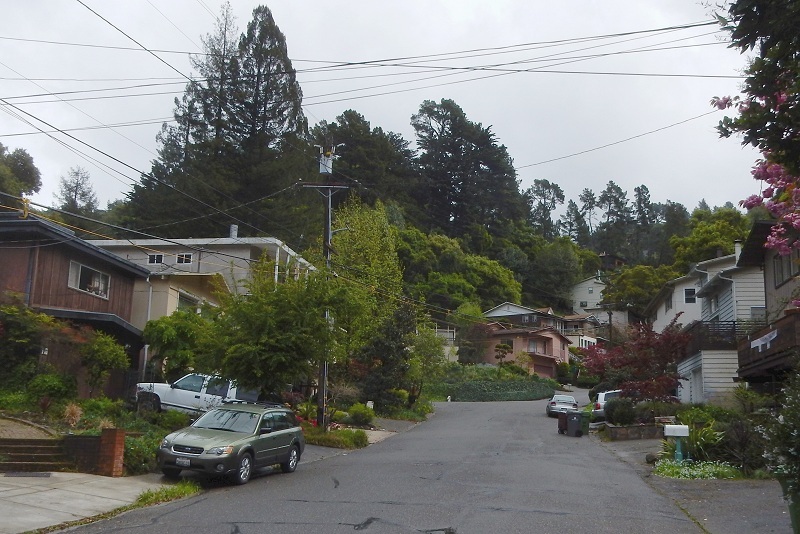 In December 2006, I read a series of news stories about a landslide in Fruitvale, on McKillop Road, that took out a house and threatened two more, so I checked it out and was so impressed I wrote it up for About.com. 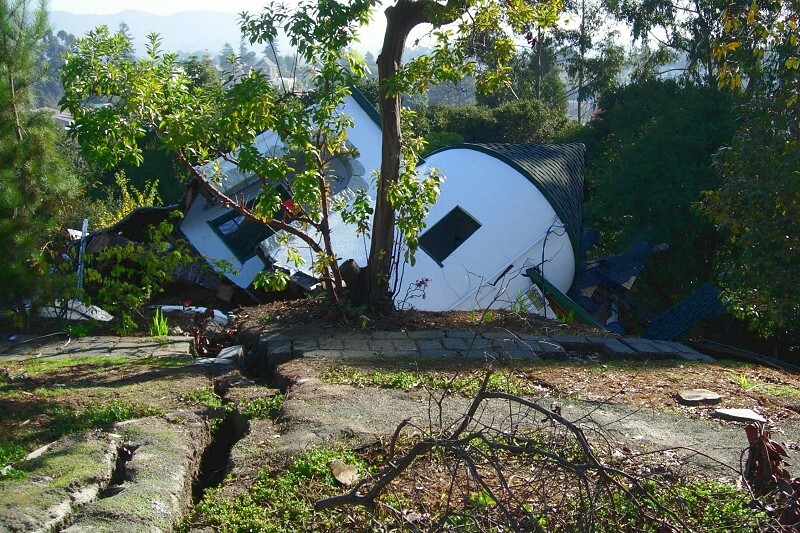 This house was the victim. And this was its front yard. When I revisited, last week, the three concrete steps were still there and the little pine tree next to them was over 20 feet tall. 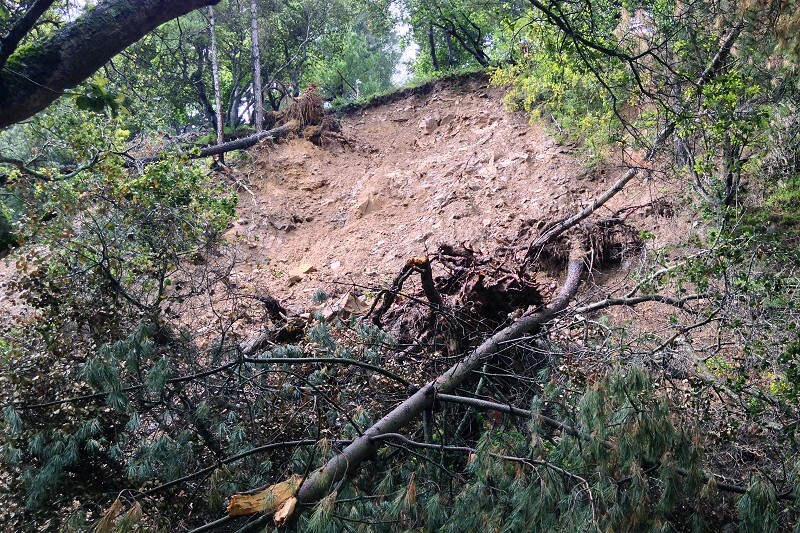 This slump was the extension of an adjoining land failure earlier that year. In 2006 I was able to make my way across the top of that older slump and take this shot from the other side. Nowadays the scene is well secured and overgrown with brush, but nevertheless the land is basically ruined. 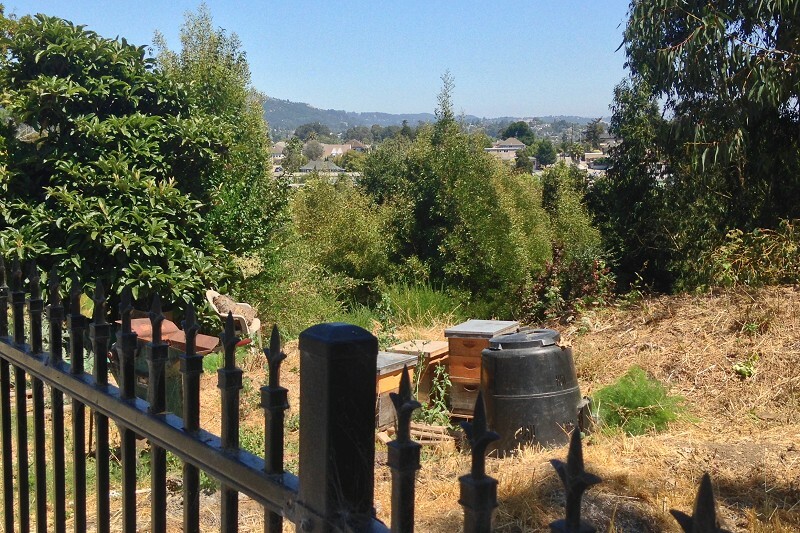 The city is storing some stuff there, and there are some beehives. 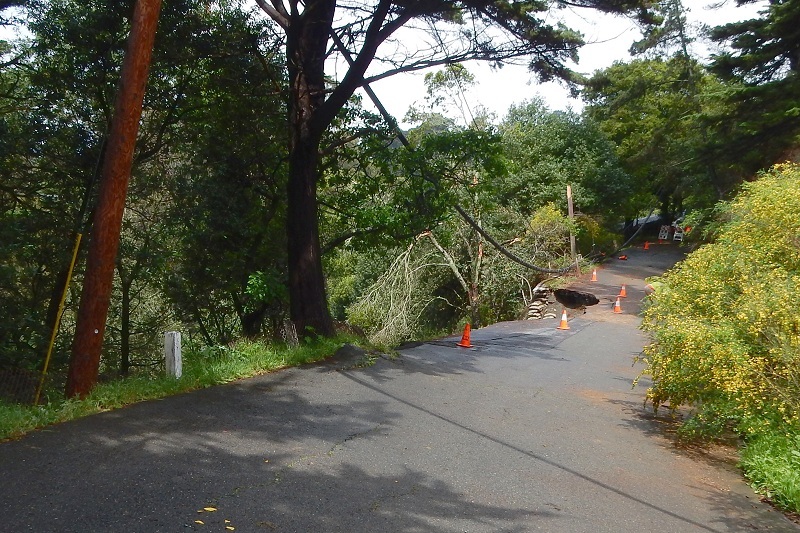 You can’t really fix landslide scars. On the human scale, they’re permanent. 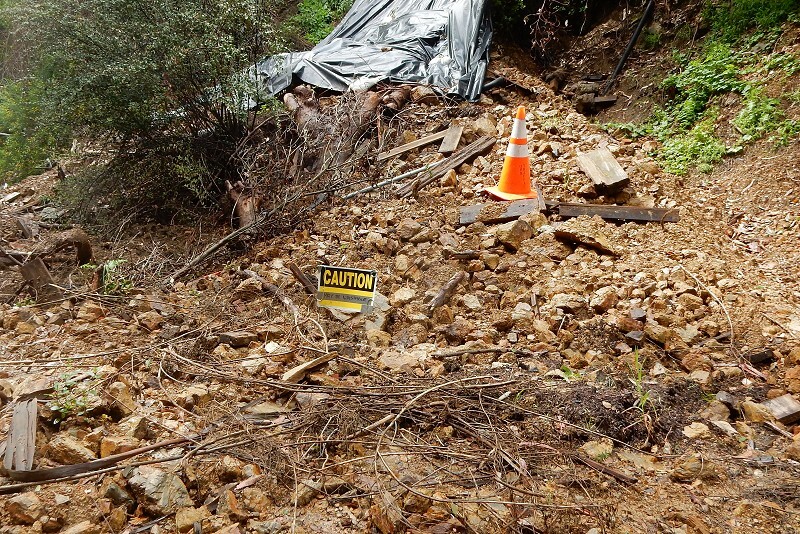 And landslides tend to feed on each other — when a portion of a slope fails, the adjoining slopes often follow. That’s the case on McKillop Road. 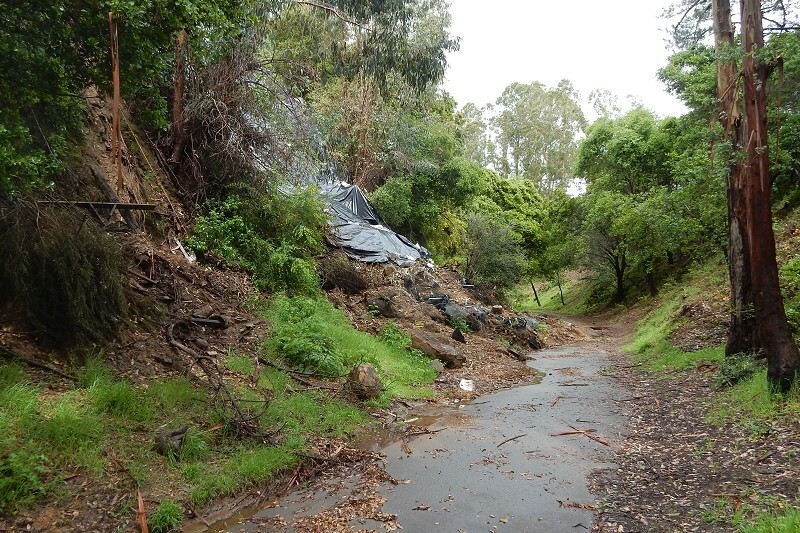 William D. Wood Park is actually the scar of much larger landslides that have occurred, according to one report, since 1909. The Oakland Tribune reported in 1936 after one such slide, “The property upon which the houses were built was originally filled-in ground from excavations made at the [Central Reservoir] site 15 years ago, neighbors said.” Throughout the 1940s and into the 1950s, it was routinely called the city’s worst landslide. Studies were made along with attempts to stabilize the slope, to little avail. Homeowners were putting their houses on jacks. Nature may not have given up fighting us, though. 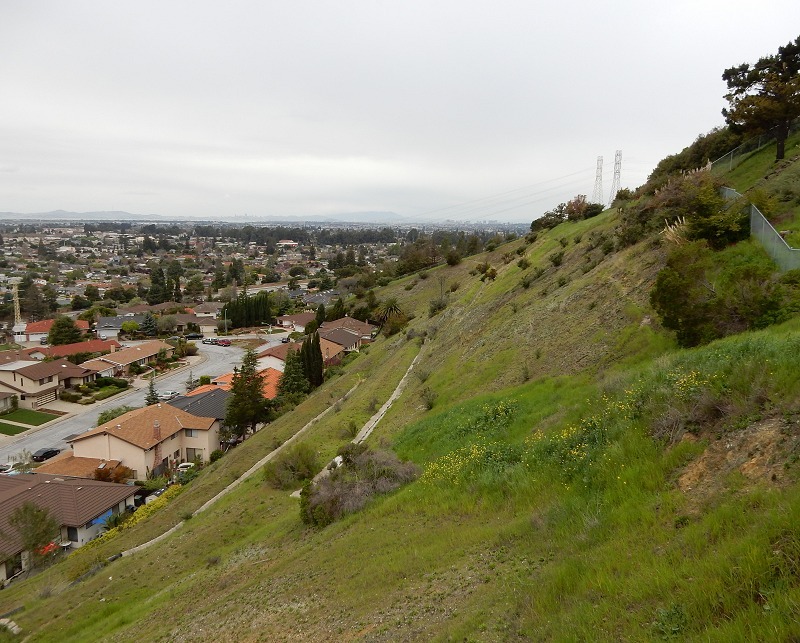 San Leandro is a much smaller city than Oakland, but it has its share of interesting rocks and features. ‘Twas a cloudy day when I visited, but the worst day geologizing is better than the best day working. Here’s the geologic map with the photo locations numbered on it. 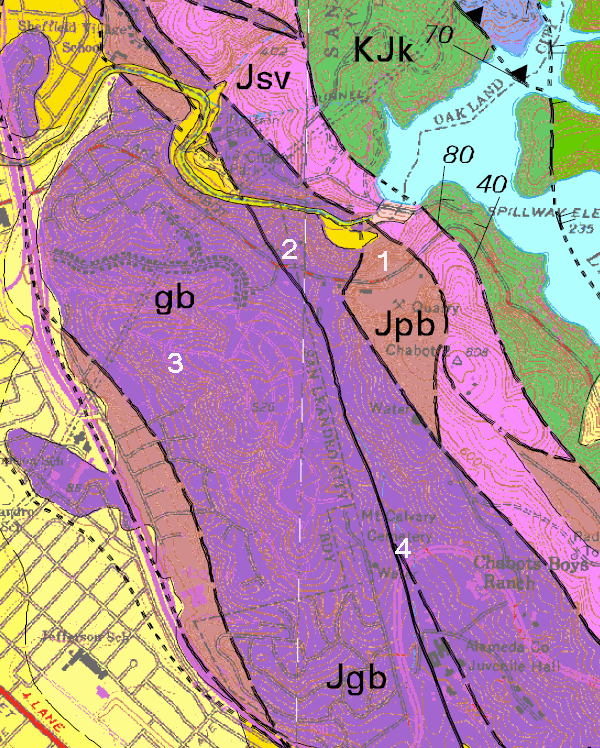 The purple area marked Jgb is underlain by the San Leandro Gabbro, of Jurassic age, a crystalline rock similar to granite that belongs to the Coast Range Ophiolite. 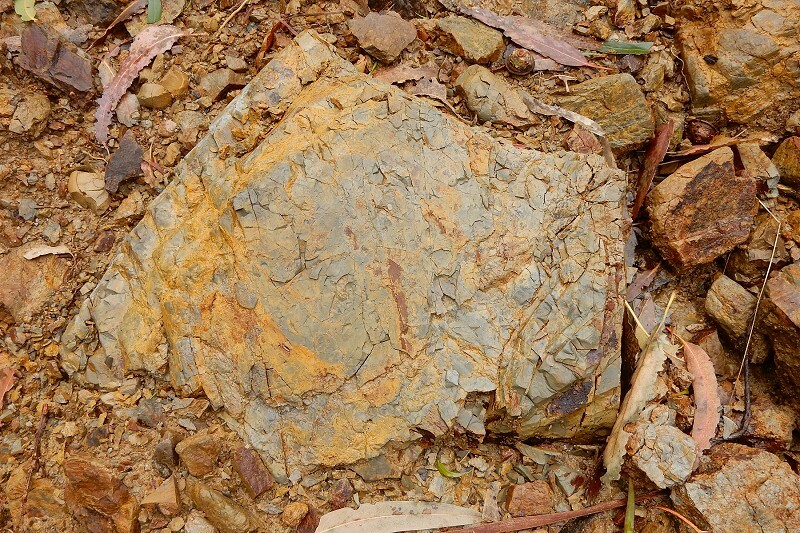 It’s about 160 million years old and was once a deep-seated part of the oceanic crust. Unfortunately the color, while it follows the official U.S. government geologic color guidelines for Mesozoic plutonic rocks, makes the map hard to read. 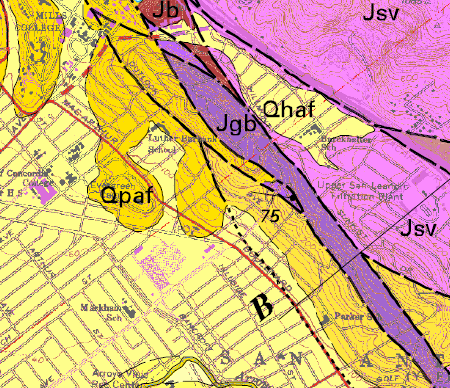 The blob of brown marked Jpb represents Jurassic pillow basalt, which I thought would be very interesting to see. And the solid black line down the middle of the map is the Hayward fault — it’s solid black because the fault is very well mapped there. 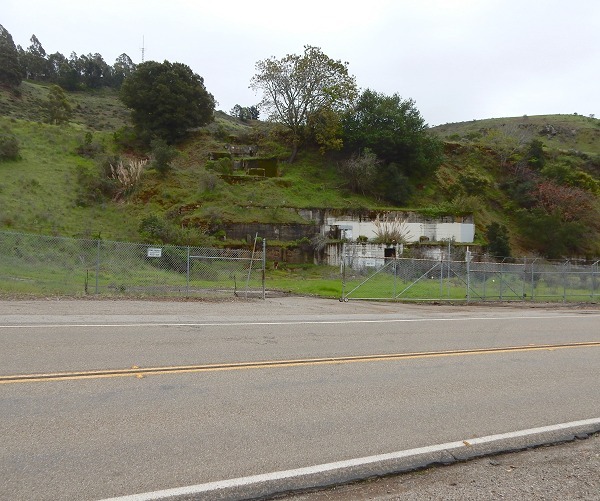 The San Leandro Rock Quarry has been closed for a few years. 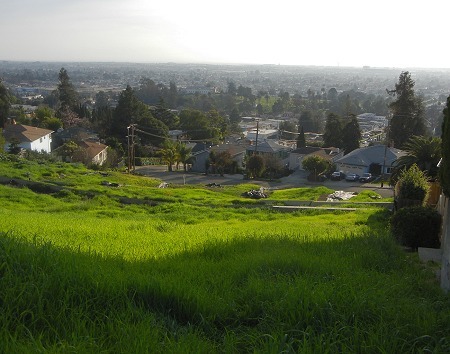 The land is for sale — 58 acres of it, right on the Hayward fault — but I didn’t feel up to impersonating a possible buyer, so it was off limits. 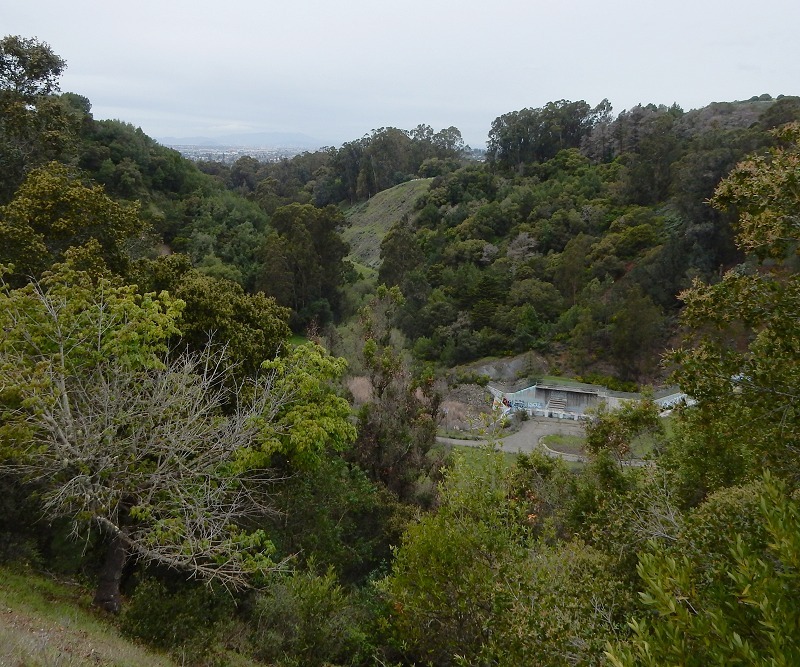 But the view the other way is pretty cool, overlooking the gorge of San Leandro Creek below the Chabot Reservoir dam. 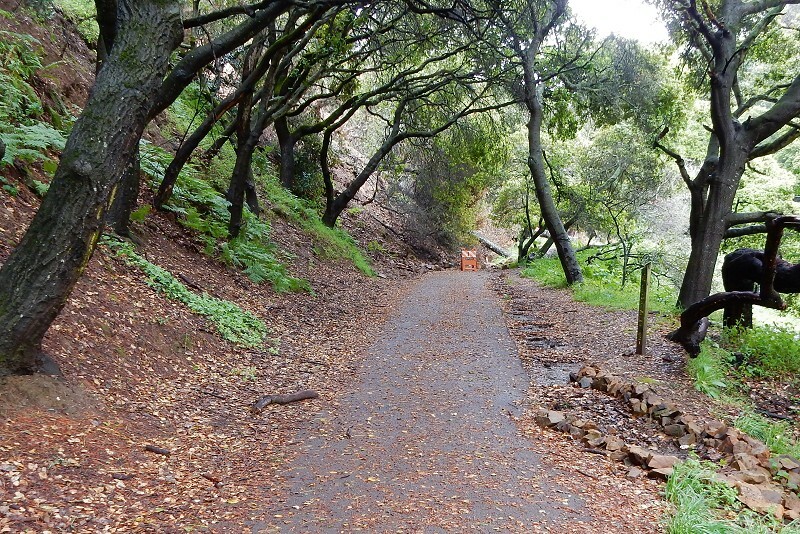 It’s the biggest canyon between Niles Canyon and Wildcat Canyon and pretty intimidating. 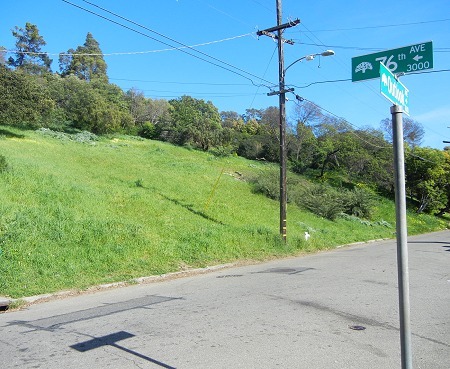 A little ways west on Lake Chabot Road, where it meets Astor Drive, is a saddle in the hillside where the Hayward fault crosses the road. 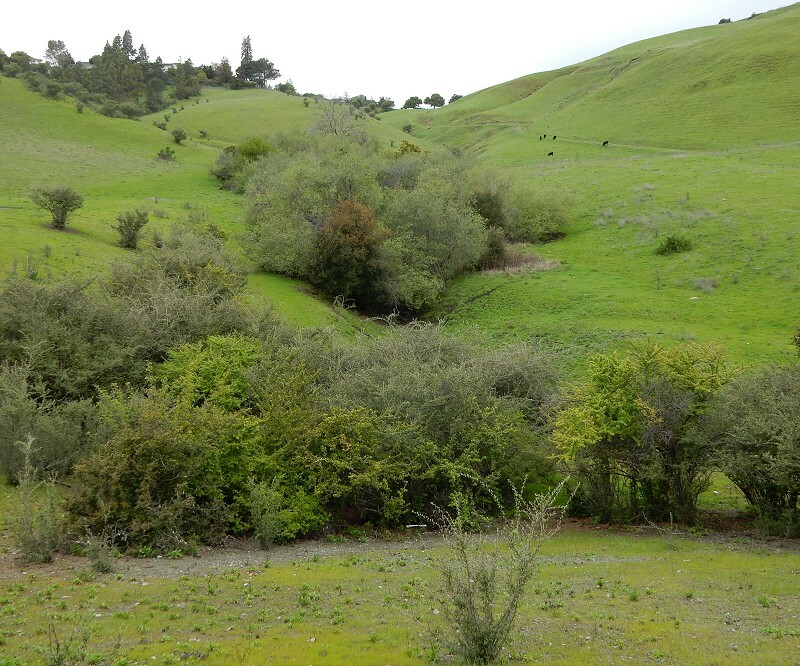 A steep gulch descends to the north along the fault trace. 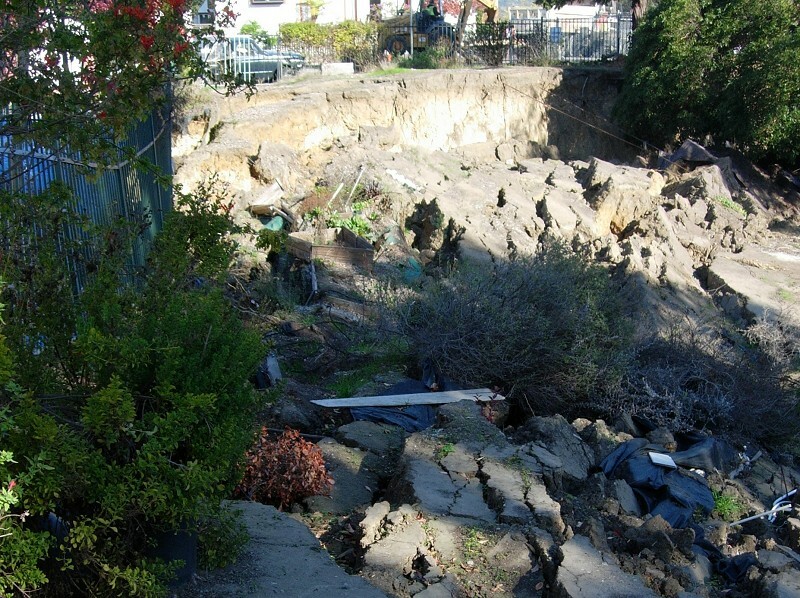 To the south, the Bay-O-Vista Swim and Tennis Club has nestled on the fault unscathed for almost 60 years. We’ll visit the fault on the other side of the club. 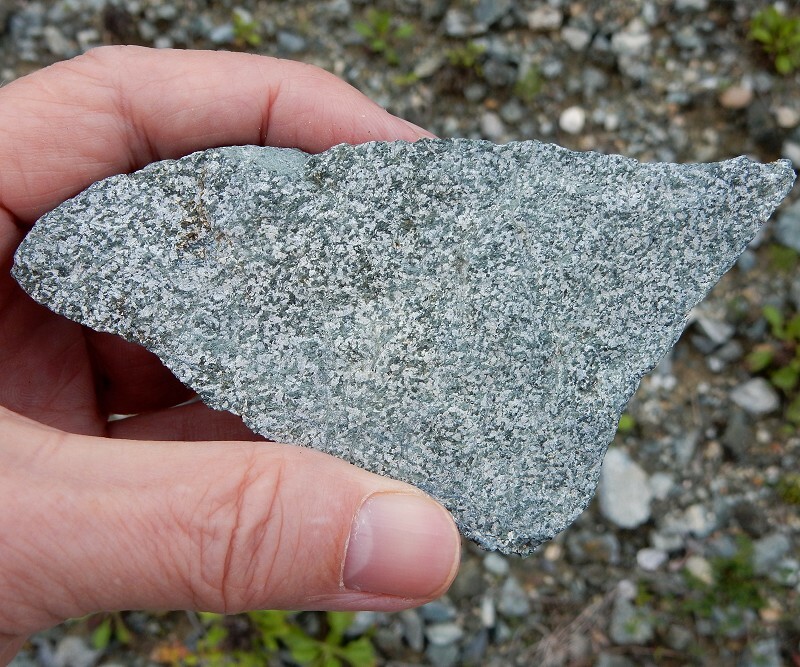 But first, the gabbro! 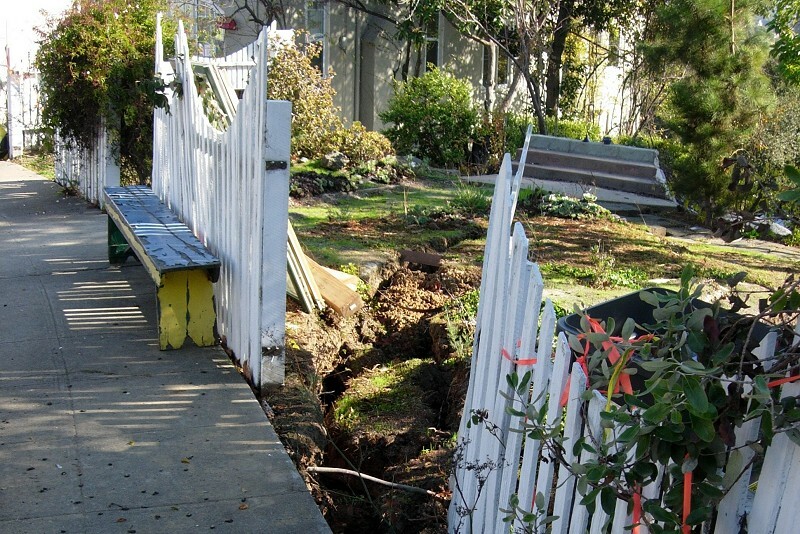 It’s exposed in various places in the Bay-o-Vista neighborhood, where it’s mostly shattered from being next to the fault for millions of years. 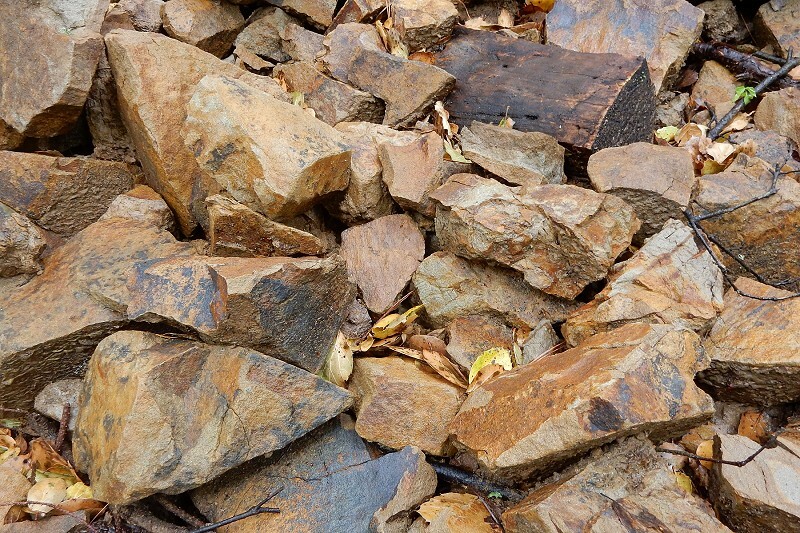 Gabbro is made up mostly of dark pyroxene and light plagioclase feldspar. Like granite, it likes to weather into decent soil. The excavations of residential areas are helpful in bringing it into view. And up close, this gabbro is pretty. 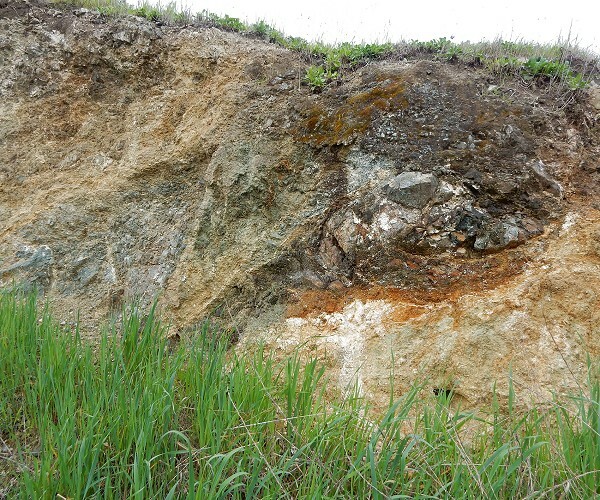 Studies of this area using airborne gravity meters and magnetic instruments suggest that this gabbro extends well north and south of here in a big slab about 3 kilometers thick lying between the Hayward and Chabot faults, tilted almost straight up and down. This figure is from a 2003 study led by Dave Ponce of the U.S. Geological Survey. 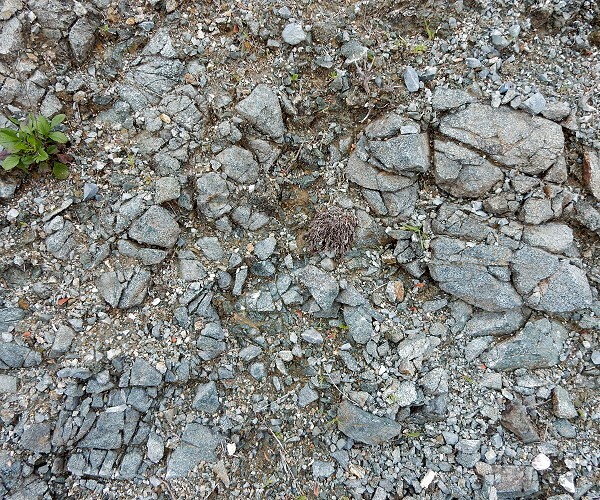 In Oakland, the gabbro shows up in stringers and blobs along the fault as far north as Chimes Creek. I’ve picked up pieces on Eastmont hill by the reservoir. 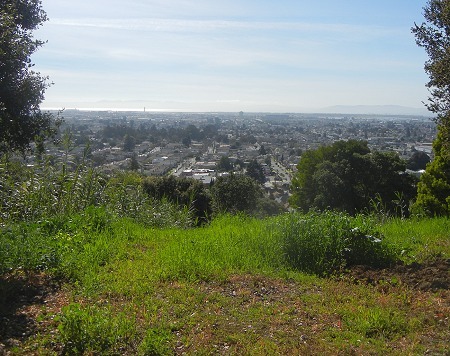 But the geophysical study suggests that it underlies a much larger area as far as Merritt College, beneath the surface rocks. 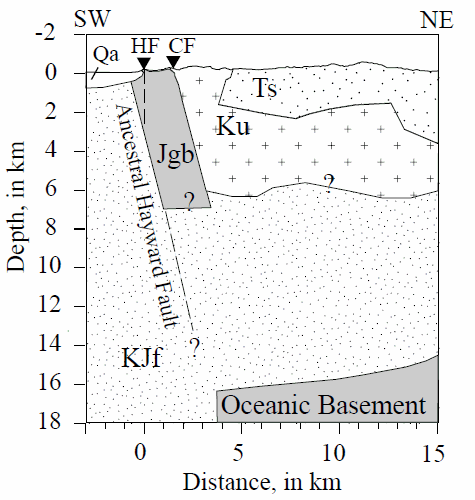 The gabbro is strong enough that it bends the Hayward fault slightly off course. 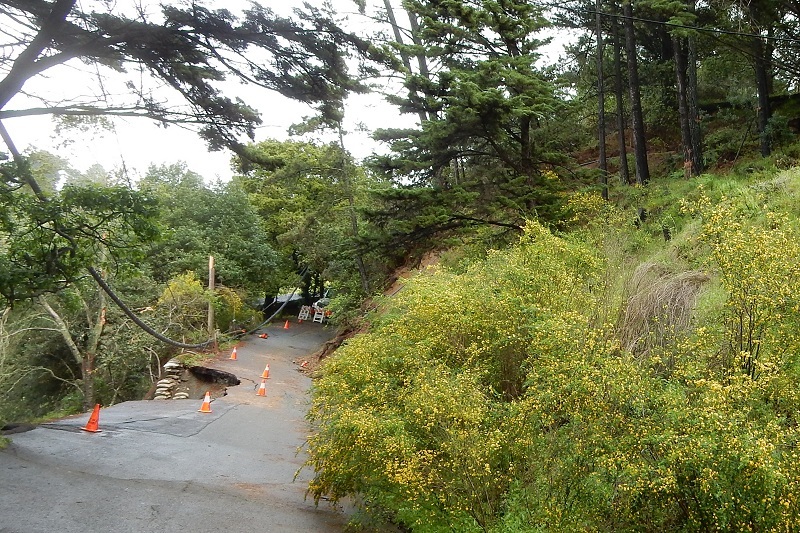 But during the 1997-98 El Niño, a big hunk of hillside gave way just below the place where I shot the outcrop. Two homes were lost. The top of the slide displays some pretty rotten stone. Farther south, Fairmont Road swings around the county juvenile justice center past the Hayward fault. This is looking north from there up the fault trace. Our active faults grind up the rocks so fine that they’re easily eroded into gulches, gullies and valleys, and that’s what this one is. It last ruptured on October 21, 1868, so any trace of that is long gone. It takes careful trenching studies to find it. We’ll have to wait until the next big one to see where it decides to rip up the ground. 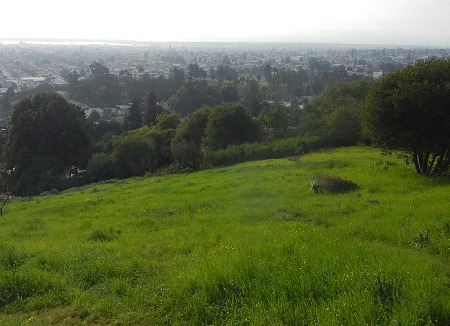 I’ve been surveying the low hill between Mills College and Holy Redeemer College, home of the Millsmont and Eastmont Hills neighborhoods. Its western face has no bedrock, either on the geologic map or in my experience. Here’s the relevant portion of the geologic map. Its crest is supposedly Jurassic basalt, which would be part of the Franciscan assemblage. 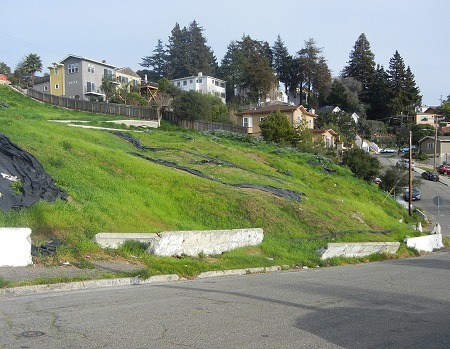 But the Hayward fault runs right along its length, and I lean toward calling it a pressure ridge. Long story short, it is squeezed up, shattered, and oversteepened, and these make it prone to landslides. 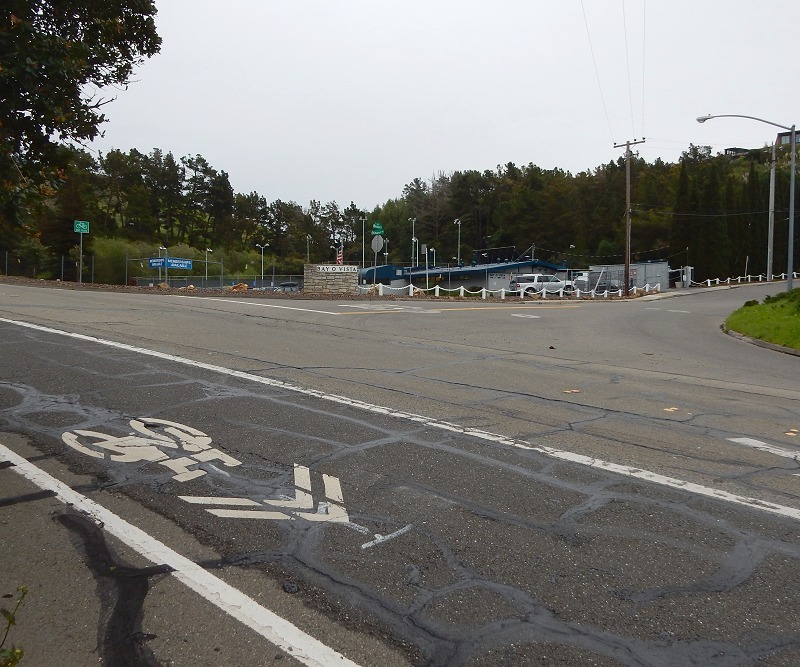 Here are some, starting with the notable example at the top of 64th Avenue. This is its toe . . .
. . . and this is the view from its head, at Delmont Avenue. Another is above Outlook Avenue, south of 76th Avenue. As you walk along its base, you’ll see bits of concrete from the homes that once stood here. 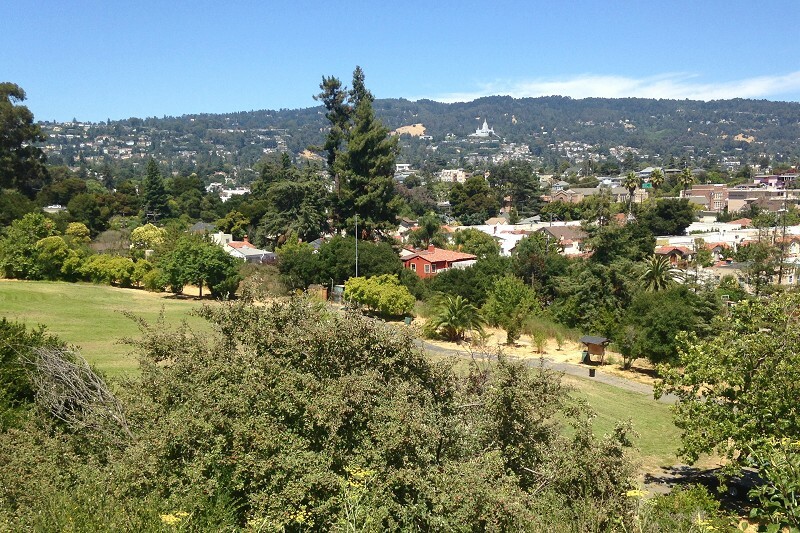 Above it, on Hillmont Drive, there is a gap in the houses that offers a nice view. 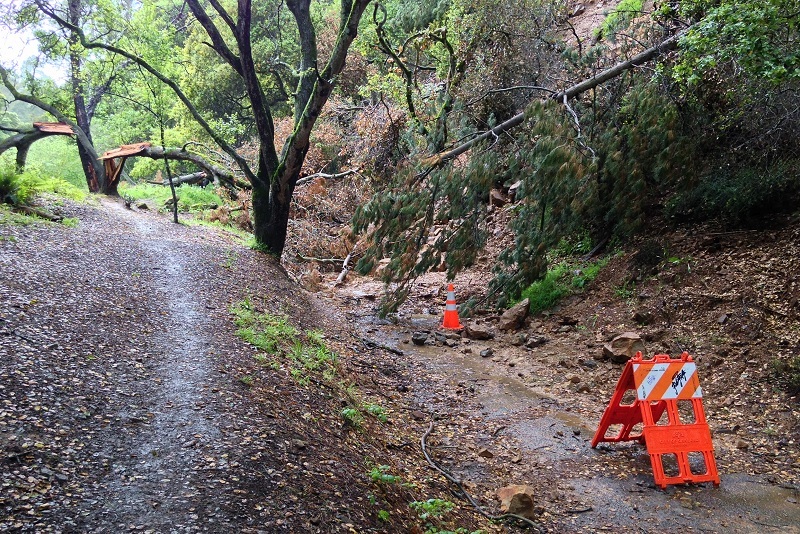 I have no business saying whether a landslide is responsible. Between these two obvious slides are some fine hillsides. This one, below Simson Street, makes a lovely backdrop to the Eastmont mall and, it seems, a nice informal park for the residents. 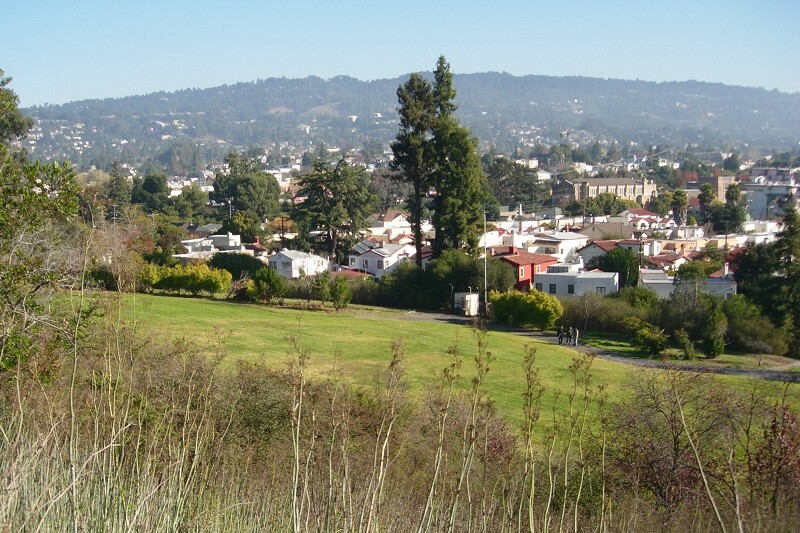 It isn’t really vacant—all of the lots that subdivide it are extremely long for some reason. I think that spaces like this, shared without fuss by the landowners around it, are very precious.